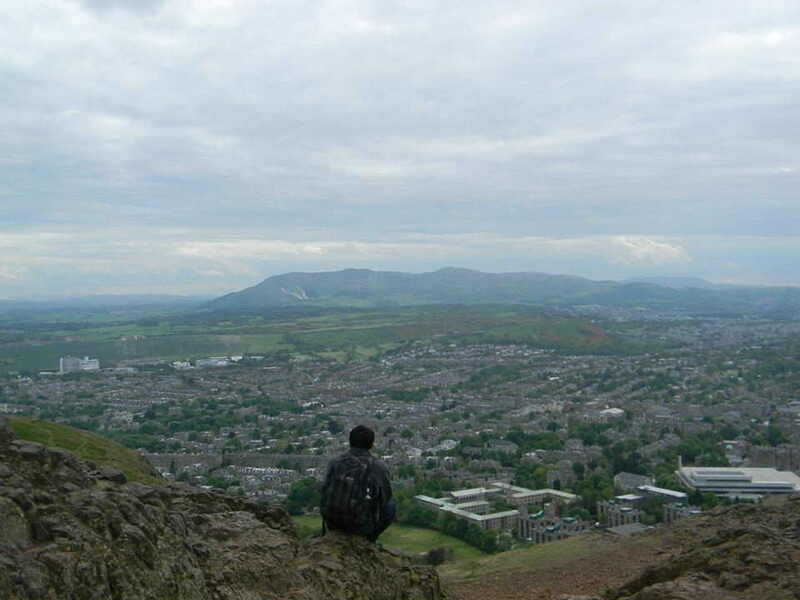 Sitting on top of Arthur’s Seat, I looked out over the beautiful city of Edinburgh. Arthur’s Seat provides its visitors with a 360˚ view of Scotland’s capital city, Edinburgh. This big hill is named for its possibility of being the location of the legendary castle of Camelot. Of course, this topic is frequently up for debate, and historians are unable to prove Edinburgh’s claim to fame. Yet, simply standing in the potential spot King Arthur and his knights housed their round table is enough to reignite the wonder and excitement these stories bestowed on me as a child. The trek up to the summit of Arthur’s Seat is an easy hike that can be enjoyed by the whole family. Even if you are unable to make it to the summit, there are wonderful views along the way. With a bit of determination, my friends and I braved the dense patches of prickly gorse to reach the top and enjoy the magnificent view. We will never forget that magical moment. Edinburgh is a lovely city that deserves more recognition and praise from the international community. The four nights I spent in this historic city wasn’t enough to truly appreciate its beauty. Taking a stroll through the narrow streets of Edinburgh, I was constantly transported back in time – whether it’s imagining the hustle and bustle of Edinburgh’s Grassmarket, or hearing stories of fearless men scaling the walls of Edinburgh Castle during the first war for Scottish independence. Edinburgh Castle itself is enough to make someone fall in love with Scotland’s capital. The castle is strategically positioned atop a cliff in the middle of the old town. It is the perfect place to protect the capital from tyrants and invaders. If one takes a tour of the castle, they will learn about Scotland’s bloody history and their fight for independence. The castle also houses the crown jewels and other important artifacts, like the Stone of Destiny. In the modern era, Edinburgh is now home to the government of Scotland and the prestigious university of Edinburgh. The Scottish capital also boasts some of the best pubs and artistic venues in the world. The world renowned Fringe Festival got its start in Edinburgh. This festival is now celebrated in dozens of countries, giving performers a space to express themselves. I have not been to the one held in Edinburgh, but I went to the festival in Prague and it was fantastic. While you are exploring the city, I highly recommend searching for walking tours run by New Europe Sandeman. When visiting a new city, I always check to see if this company offers a free walking tour. The tour guides do a brilliant job of painting a vivid image of the things you see around you. The tours are a great way to see the city while figuring out what to do next. I often ask the tour guides where the best restaurants and pubs are. If you enjoy a good ghost story, Sandeman offers a Dark Side Tour. This tour will give patrons a glimpse of what it was like living in the time when Dr. Jekyll and Mr. Hyde terrorized Edinburgh. Whisky and single malt are slowly becoming fashionable again. If you are like me and enjoy a good pour of a fine whisky, there is no better place than Scotland. There are many distillery tours one can embark on if you fancy seeing the countryside while under the influence. If you don’t have the time or budget for such an excursion, Edinburgh has multiple shops where one can find any whisky they desire. Finally, it is possible to explore the Scottish Highlands from Edinburgh. There are tons of different tours to choose from. Some are day trips while others are overnight adventures. Since I had limited resources, I opted for a simple day trip to Loch Ness. This trip was spent mostly on a bus, but the tour guides were fabulous and gave a good sense of the landscape and the violent history among Scottish clans. We stopped to see hairy coos (highland cattle), Glencoe, Ben Nevis, and Loch Ness. It was a great way to get a glimpse of the Highlands, but I cannot wait to get back to Scotland and see more of the rugged countryside. P.S. Almost forgot to mention that J.K. Rowling wrote Harry Potter in a café in Edinburgh. She used several local landmarks and names in her stories.